SKIWALKING.COM LLC and the American Nordic Walking System: Our quality one-piece Nordic walking poles are safer, lighter, more durable, more dependable and much more user-friendly than the cheap and flimsy twist-lock and flip-lock 2-piece and 3-piece collapsible walking, hiking, trekking poles, and sticks flooding the market from China. Twist-lock and flip-lock walking poles rattle, vibrate, freeze up, gradually collapse or collapse unexpectedly. 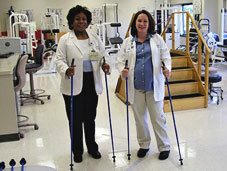 Our one-piece Nordic Walking poles are user-friendly and dependable! Doctor, therapist and trainer recommended. All of our SWIX And EXEL Nordic Walking Poles come equipped with removable natural rubber tips/asphalt paws – ideal for Urban Nordic Walking and pounding the pavement. The metal tips are for trails, the beach, snow, and ice. Equipped with real Nordic walking straps – comfortable fingerless glove type straps patented by the Salomon Ski Company. Free Nordic Walking DVD included. Super fast shipping. All of our poles come with our LifeTime breakage guarantee, perfect length guarantee and a 100% satisfaction guarantee! Unlike other walking poles, our durable one-piece walking poles are tough enough for skiing – because they are real ski pole shafts. Collapsible poles are not durable enough for skiing. Athletes destroy collapsible poles. One-piece poles are much more durable. And because there are not twist-locks or flip-locks, they are not just more durable they are much more user-friendly. Our SWIX and EXEL Nordic Walking Poles can also be used for hiking and trekking – companies selling cheap/collapsible poles put out warnings knowing their poles are not durable enough for use in the mountains. Our one-piece poles are durable enough for hiking and trekking in the mountains, and this makes them durable enough and trustworthy enough for seniors and individuals with severe balance issues.